I joined my colleagues for vegetarian lunch today, although I don't really fancy Chinese vegetarian food. I went for the company and it was alright. But it reminded me of what I really feel like having, Hakka lui cha or thunder tea literally translated, though there are the vegetarian and non-vegetarian variety. I especially like it because of the green colored broth packed with ground mint, basil and tea leaves. I can almost taste it now. My colleague, Teresa, who was also at the same vegetarian lunch, did tell me that her father-in-law makes it often at home. I'm still waiting for the invitation that sadly will never come. 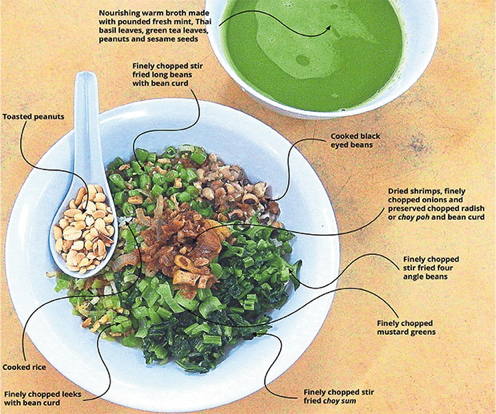 So I found this article in The Malay Mail Online and I will surely check out those places for good servings of lui cha.